What would happen if you truly became invisible—and your family didn’t even notice! 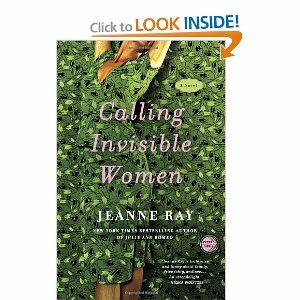 That’s the premise for the book Calling Invisible Women by Jeanne Ray. A mom in her early fifties, Clover knows she no longer turns heads the way she used to, and she's only really missed when dinner isn't on the table on time. Then Clover wakes up one morning to discover she's invisible--truly invisible. She panics even more when her family doesn't notice a thing. Her best friend immediately observes the change, which relieves Clover immensely--she's not losing her mind after all!--but she is crushed by the realization that neither her husband nor her children ever truly look at her. She was invisible even before she knew it. Clover discovers that there are others like her, women of a certain age who seem to have disappeared. As she uses her invisibility to get to know her family and her town better, Clover leads the way in helping invisible women become recognized and appreciated no matter what their role. My Point Of View: The book has a unique premise which drew me to it. I can understand the feeling that your family doesn’t see you—they simply take for granted all that you do. The book also makes you realize how much time you take looking good—ie, applying makeup, buying the “right” outfit...is it really all necessary? I don’t want to give away too much but I really enjoyed the book. The ending put a huge smile on my face. This is the perfect beach book—or anytime book, really. About The Author: You can learn more about Jeanne Ray here. Crown and Broadway Publishing are offering a lucky reader a copy of the book. If you don’t want to wait, you can purchase the book on Amazon here. Mandatory Entry: Tell me have you ever felt invisible before. I will run the contest until May 8th. You might enjoy the Ivy Malone Mysteries series by Lorena McCourtney. The first book is titled "Invisible". Well that sounds a book I need to have. So interesting. I want to read it just to know if she becomes visible like she deserves. I think we have all felt invisible at some time. Right now with all that I am going through, I feel invisible in more ways than one. Seems like a good read. After I'm done reading my most recent download definitely one to check out! I feel pretty invisible on a regular basis. Most of what I do around the house seems to go unnoticed and unappreciated. Although, I should say that my kids think my husband is invisible. They NEVER ask him for anything. They even walk right past him to ask me for help. Drives both of us crazy! I take book advice from you pretty seriously. Honestly! I feel invisible a LOT in my family, especially since the baby nurses less these days and doesn't need me quite as much. I feel like no one hears me sometimes. Thank you for yet another recommendation! I don't usually feel invisible, just not memorable. I actually think my family would miss me if I were gone, my kids are still little, so they are still cuddly and seem to enjoy my company (hopefully that will continue). However, I sometimes feel like people I've met before will have no memory of me at all. I don't know if it's true, or if I'm just a little crazy. There are a few times I have felt invisible when my kids don't listen to me! As the oldest unmarried sibling it's hard not to feel invisible. I liked Jeanne Ray on facebook. The book looks super interesting. I might have to buy it if I don't win. Every day of my life, man. It's kind of a joke amongst my friends because if we go to a restaurant, inevitably, I'll be the person whose order gets forgotten, or who never has their order taken in the first place. I also have to introduce myself to people multiple times, because they never remember meeting me. Jeanne Ray is one of my favorite authors. I have read all of her books except this latest one. I have felt invisible MANY times in my life, and I think it is do to my lack of confidence and weight issues. I have been slacking on my reading lately. This seems like a book I'd be interested in reading. I have felt invisible plenty of times. To be honest, there are also times where I wish to be invisible. I hope to be entered into the drawing. Andrea @ be-quoted.com visiting from SITS. I feel like a "Silence" from Doctor Who. As soon as you turn away from me, you forget about me. I feel invisible all the time. I think everyone feels invisible at some point or another. I feel invisible because I'm so shy I seem to blend into the woodwork when at gatherings. *shrugs* I'm trying to grow out of it. I liked the author on Facebook. I have felt invisible before...mostly through my teenage years tho. Yes, I have felt invisible. It's hard to not be discouraged during times like that. This sounds good!! I've definitely felt invisible, especially in high school when I wasn't popular! I feel invisible in group situations where everyone is talking. I find it hard to be noticed and listened to. First off, OMGracious! This makes me so happy! I discovered Jeanne Ray via my neighborhood book club up north year ago and promptly read all of her books. As far as I know, she hasn't had a new one in awhile. I'm so EXCITED! That said, heck yes, I've felt invisible... in high school when all the other cheerleaders had boyfriends but me... I surely felt like no one saw me... or worse... they did and didn't like what they saw! Absolutely I have felt invisible. Especially when my husband gets home and the kids listen to him. It's like, hello, mom just said that 3 times. Der! Yet I do feel invisible more around the in-laws then in my own home. Sounds like a great book! I really like your site and I really like the Hey It's Ok Post, I think I might have to do something like that.